A year ago today I mentioned our record sales of cell phone gloves and one year later things haven’t changed. This past weekend we surpassed last year’s sales already. I’m not surprised since we expanded our cell phone glove choices to over 23 models and styles – not including all of the sizes and color options. In fact, we even have a special shopping page dedicated to Cell-Phone Gloves. This page makes it easier to narrow your choices down from all of our winter glove offerings and includes all of the men’s, women’s, and girl’s models ranging from fashion leathers to colorful knits. When shopping for cell-phone gloves you need to know that there are two types. One type has removable finger tips and thumb tops and the newer types are touch-screen versions. 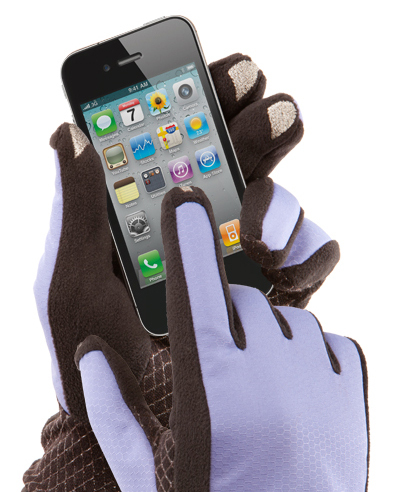 With either type you don’t have to remove your gloves in the cold weather to use your cell phone or tablets. We also offer a handy Gift Certificate option for those picky persons on your holiday shopping list. This way they can pick the model they prefer and you don’t have to guess on the size or color either. Although we are probably the largest source for cell-phone gloves, I wouldn’t delay. They will sell out fast since they make ideal gifts and stocking stuffers. It’s rare that I mention children’s gloves and I’m not sure why since they have represented a large share of our business for many years. As a matter of fact, I’ve even developed and made some models for other companies. It’s a hand protection segment often overlooked by the big glove companies but kids need and like gloves, too. The obvious thought that comes to mind is protection from the cold during the winter months. I remember that well when I was a kid and gloves were as important as a good pair of boots and my mother was always right to make sure I was equipped with a good pair of gloves. After all, they were vital for snowball wars! Many don’t think about it, but we offer children’s gloves for every imaginable need. Examples are: church functions, school plays, white gloves, cotillion functions, bell choirs, work gloves helping dad and mom, winter sports, and even parade gloves. If you’re curious or need some children’s gloves you can go to this link to see our entire lineup. By the way, they make great stocking stuffers, too! 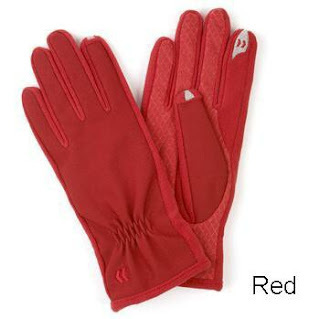 Shown in the image are the Wells Lamont Children’s WorkGloves. The All-Day Protective Glove Liners not only continue to be great gloves for many types of users, they also represent my history in glove design, development, and manufacturing going back to 1989. I originally developed these gloves as glove liners to protect healthcare workers from problems with latex gloves. That was back when these same healthcare providers had to wear gloves “by law” to protect them from blood-born pathogens due to the AIDS virus. In a nutshell, they were the first universally sized, thin-knit gloves which could be worn under disposable gloves. It isn’t rocket science today but two decades ago it was and I landed in the glove business overnight due to the unmet demand for thin knit protective gloves. To make a long story short, these same gloves found their way into the manufacturing glove wearing sectors and eventually became the benchmark in the photographic and imaging industry to protect films, negatives, and photographs from workers handling them. Now, I’m in the scanner cleaning business and this guy is bringing these gloves into the digital age. I wish I thought of this but I’m still the Glove Guru. Yes, every year in October we see a rapid spike in our consumer glove sales. It’s no mystery either. It is all about people looking for that special glove to add the final touch to their Halloween costumes. Although most of these glove sales include our white glovesand our colored gloves, we do see an uptick in glove sales with our opera length colored fashion gloves and our black gloves among a few others. In fact, I’m told by our staff that the customer phone requests can get rather amusing, too. From a businessman’s perspective, I’m inclined to believe that our prices are so low, their almost scary. And that’s no mystery either. Happy Halloween from the Glove Guru. 5 Million New I-Phones were sold this past weekend, so you can imagine we will be overwhelmed with glove orders for these extraordinary gloves. The cold weather is here already so don’t wait and be forced to settle for a model that is out of stock. We were the first to introduce cell phone gloves to the world back in 2008 and we sell out our allotments every year since. Our best sellers are the Isotoner and Freehands models and they are great gifts, too. We stock many models, many styles, including men’s and women’s models and teens. 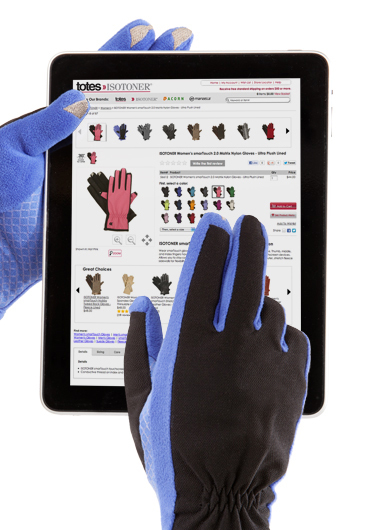 And by the way, our touch screen gloves will never be obsolete. Many customers ask what Nappa Leather is so it’s time to strip away the myths about Nappa leathers. Nappa leather is full-grain leather, typically dyed, and made from unsplit kidskin, lambskin or sheep skin. It is tanned with salts of chromium or aluminum sulfate, and noted for its softness, stretchiness, flexibility, and durability. It is often used in high-quality leather products such as high-end furniture, wallets, handbags, and most often high quality dress and fashion gloves. Nappa leather should not be confused with cowhide which is thicker, less flexible, and used in heavy-duty work gloves. Even though Italian leather craftsmen have mastered making and working with Nappa leather, the tanning process which produces Napa leather was invented in 1875 at the Sawyer Tanning Company in Napa, California. The new ICON Designer Art Leather Gloves arriving in October are now available for pre-order since we purchased all that the factory can produce this year. Quantities will be limited due to their popularity, limited production, and the fact that these glove models have become collector’s items. The design patterns change annually so we suggest you reserve your own personal pair today. The ideal Christmas gift this year. This pre-order program has been popular since 2007 for our Chinchilla Lined Gloves. Order today and we will guarantee immediate delivery once they arrive. 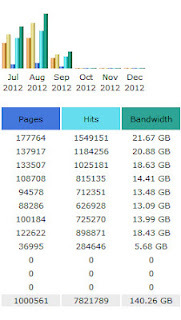 Early today, Gloves-Online.com reached the astonishing milestone of One Million page views since January 1– and before our busy season. 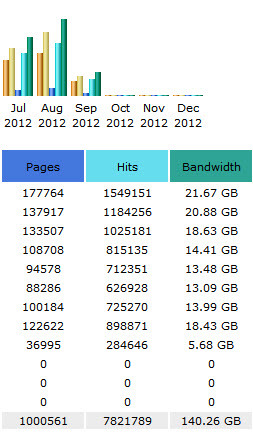 Page views are the conservative metric when evaluating web site analytics. For example, if we counted actual hits, the number would be 7 to 10 times higher due to images, etc. You can see this in the chart. Although we are very proud of this success, I wish to thank all the glove families that made this happen. My thanks (ranked according to their contributions) go to Mr. & Mrs. White Gloves, Leather Gloves, Winter Gloves, Fashion Gloves, Church Gloves, Bamboo Gloves, Sport Gloves, Cotillion Gloves, Usher Gloves, Coated Gloves, Cut Resistant Gloves, Grip Gloves, Fancy Gloves, Parade Gloves, Heat Resistant Gloves, Mechanics Gloves, and Electrician Gloves. To demonstrate the significance of this number, we have not factored (added) in the customers that migrate to our industrial web site from GO to purchase their industrial and safety gloves. The GO Industrial web site is a completely different web site and we obviously don’t share those metrics since many people follow this Blog – a.k.a industrial espionage – but you can perceive those hits. For the skeptics out there, I’ve added a web shot image of our actual metric scale which can be enlarged. I doubt there is another glove company in the world that has reached this milestone in less than 9 months. After all, we were the very first global glove company on the Internet since 1996. I can’t wait to see how successful the internet shop of our fine fashion glove boutique in St. Thomas, USVI, Olga Gloves, becomes. Olga Gloves is proud to be appointed the exclusive supplier of ICON Gloves in the US Virgin Islands. The new ICON Gloves are Italian Nappa leathers and the designs are intrinsic to the leather. Olga Gloves also has a pre-order option since the new models will arrive in the shop at St. Thomas in October. Today, marks three (3) years since I launched the GO Greens® Bamboo Gloves web site. Most of you are already familiar with the GO Greens®gloves but you may not be aware with the numerous benefits that our gloves made from bamboo offer. It’s worthwhile looking at the GO Greens®Gloves web site and learn why I embarked on year-long effort developing these gloves over 3 years ago. You will discover, like me, things like 100% biodegradability (compostable), 10 times stronger than cotton, natural UV resistance, low costs, eco-friendly, and so forth. There is even an enlightening section on the web site that educates you about bamboo and the virtues of products made from bamboo – the most sustainable plant on earth. If I knew 20 years ago what I know today about bamboo, I would have planted bamboo plantations in the coastal plains of eastern North Carolina to replace tobacco. I might be a lot wealthier but then I would have missed the fun bringing the GO Greens® Bamboo gloves to the world.